Sharon is a professional and talented MUA I’ve worked with many times. From bridal, editorial, boudoir and teaching to special effects, Sharon’s friendly manner and skill make every client comfortable and delighted with her work. I can not recommend Sharon highly enough as a wedding make up artist. From the moment I got in touch with Sharon enquiring about her availability, to the day of the wedding itself, I found her extremely professional & easy to deal with at all times. Her experience & product knowledge is second to none. On the day of the wedding Sharon arrived with a smile & calmness that was very welcome in a really busy house. Myself, my three bridesmaids & Mum all had our make-up done.Sharon took her time with each of us & at no stage did any of us feel rushed. My Mum was delighted with hers, as she doesn’t normally wear eye make up, so Sharon suggested using clear mascara, which worked really well. I was absolutely thrilled with all our make up, I got so many complements throughout the day. After a long day & night, and an awful lot of dancing, my make up lasted really well & I have been singing Sharon’s praises ever since. Thank you again Sharon, you did an amazing job. Thank you so much Sharon for the fantastic work you did in making my wedding party and myself look and feel fabulous on my big day in August! Everything we asked for in terms of our individual make up ideas were delivered thanks to your expertise! You are brilliant at your job and highly recommended! Not only that; you helped us all to relax (especially me!) Thanks once again and best of luck in all you do! Sharon did my make up for my Wedding in December. Having had a very smooth make-up trial in advance of the Wedding, I was in no doubt that Sharon would have me looking fabulous for my big day! During the trial she spent alot of time determining the style I was going for. I wanted a smoky eye and Sharon used a beautiful purple shade that I would never have considered using if I were to do my makeup myself. The make-up really enhanced my best features. The morning of the wedding, Sharon arrived in early and full of enthusiasm. She did make-up for three bridesmaids, my mother and me. She did a fabulous job! Everyone looked stunning. My mother didn’t want much eye makeup in case her eyes watered and Sharon managed to make her eyes look striking without any liner or mascara. Sharons professional approach, expertise and creative edge ensures that she is the only makeup artist I would have considered for my wedding. I would trust her 100% for any event/wedding/photoshoot. I found Sharon McCormack online whilst looking up Wedding Make-Up artists in the West of Ireland. Sharon’s name came up time and time again as one of the top Make-Up artists on various websites and forums so I decided to have a look at her website directly. Her portfolio was full of gorgeous bridal photos with various different looks, from the more natural look to the dramatic look. I was sold immediately. I got in contact via e-mail, and Sharon was very quick to respond to my message. As I live in Cambridge, and was arranging a Wedding in Roscommon, it was refreshing and stress relieving to have Sharon on board as she made booking the make-up trial and arranging the wedding day very easy. We kept in contact, and Sharon was able to answer all questions I had with a friendly and reassuring response. I was delighted with my make-up trial; I asked for a smokey, more dramatic eye, and specifically didn’t want any shimmer/glitter. Sharon did exactly what I asked of her and I left feeling confident that my make-up would look beautiful on the day. On the day of the wedding, Sharon showed up at 8am on the button. She did the make-up of 3 of my bridesmaids and my aunty, and they were all delighted with the outcome!! They looked fabulous!! I was also thrilled with mine; the proof is in the pudding as they say, so check out the photos ϑ I found Sharon to be professional and helpful throughout my whole wedding experience, and I would recommend her in a heartbeat for a friend’s wedding. Sharon’s customer service was second to none. Best of luck to Sharon in the future!!! On the day of my wedding Sharon was nothing short of brilliant. She worked her magic on myself and my 3 bridesmaids. She had us all looking flawless. She was professional, creative and only for her ideas i would have went with my usual safe option on the day! I had so much confidence in her that i was super relaxed the whole morning and it was lovely to have her with us on such a special occasion. Over the course of the day my make up stayed perfect. Even at 4am everyone commented on how great my make up still looked. I really didn’t want to take it off! When i look back on my photographs i’m so thrilled with how we all looked. Our eyes looked so blue and our skin so flawless. Everyone who has looked at my photos has admired our make up. From the advice Sharon gave me for my wedding i’m definitely more confident in changing my look .She gave me great advice on emphasising my eyes and how to achieve that “to die for” cheek bones look…I’m even getting in on the whole lip color thing!!! Sharon’s creative flare is one of the things that really stands out for me. She has supreme confidence in what she is doing. Her advice and encouragement to leave my comfort zone really paid off and that extra special look is exactly what i wanted and got….. Thank you Sharon for doing such a wonderful job on the day of my wedding. I couldn’t have been happier and i will be highly recommending you to all my engaged friends!!!! Thank you very much for the great job you did for myself and the girls on the morning of my wedding. Thanks also for being so nice and helpful on the day and waiting until I left for the church. I hope to see you again soon! 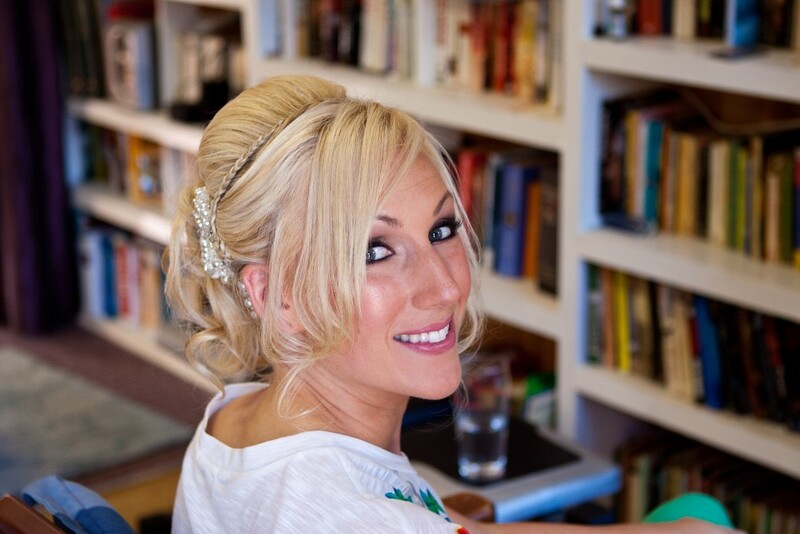 Thank you so much for the amazing work you did on the makeup for my wedding day in May 2012. My mum, four Bridesmaids and I were all transformed by your talent hand. I felt like you used a magic wand to transform us. We didn?t have to touch up at all and make up lasted well into the wee hours, almost so I felt I could wear it again the next day!!! We got so many compliments. Even looking back on pictures and the DVD our makeup is just flawless. You were so professional but also very friendly and fun. I felt like it was a friend doing my makeup. So many people have asked who did our makeup and have asked for your details. I would highly recommend you Sharon to anyone looking for a Makeup Artist for any special occasion. Thank you so very much. I wish you all the best in your future. Sharon was recently the make up artist for my wedding. She managed to make seven of us look beautiful without even breaking a sweat! Our make up was beautifully applied and lasted the entire day. She was lovely to have in the house on the morning of the wedding, fun and extremely professional at the same time. I would highly recommend her and will be using her services again. Sharon is an amazing make-up artist and I was so glad that she was available to do my make up for my wedding in June; I think I got one of her last available bookings for 2011. My make-up, my mums and my bridesmaid’s make-up was perfect and lasted well into the wee hours of the morning. (She also fitted in my Aunt who was not originally booked in with no problem at all). I was so happy to get my wedding photos back and see how well we all looked. Sharon is a fib and friendly person and made us all feel relaxed on the morning and stayed with us until it was time for the church. I would highly recommend Sharon McCormack make-up for your special day. I got married in July. I spent the year previous researching every detail as all you brides to be would know. I had a very clear vision on how the day would be from Decor to flowers, bridesmaid dress to make up. I just needed to find the people who could see the vision as I did. When it came to the make up, this needed to be perfect (as I would be very handy with an eye shadow brush myself) Sharon came to my house for a trial, I explained my idea for me and my bridesmaids and away she went. The trial went brilliant; it was such a weight off my mind, as you can imagine there was so much more I needed to get off my list. The day of the wedding Sharon came to the house and got straight into it, she really is a true professional very focused and detailed. I can say hand on heart the makeup was perfect, not one touch up all day. I was extremely emotional on the day crying every other minute and the first thing I’d say to my chief was “fix my make up” and every time she said it’s perfect! When I cry there is no hiding it, my eyes, nose and cheeks go red. But looking at the pictures you would never know I shed a tear. I am so glad I found Sharon the tools the makeup and the method was excellent. Thanks again Sharon, I know you’ll be very busy for a very long time. Donna w you’ll be very busy for a very long time. I cannot thank Sharon enough for the brilliant job she did getting us already on the morning of my wedding, she was so professional & had a great calming effect on what I expected to be a panic filled morning, but she arrived bright & early leaving more than enough time to make sure we all were looking fabulous with plenty of time for a glass of champagne & lots of pictures to be taken before leaving the house. All us ladies had different make up styles & needs, from more funky to classical as we ranged in age from being in our twenties, thirties, forties & fifties & everyone was so happy with their make-up. I myself was a bit worried as I have a touch of rosacea but my make-up lasted all day & I received so many compliments specifically about my make-up. I couldn’t recommend Sharon enough, she is a very talented make-up artist & is such a warm lovely person too, and it was a joy to have her in our home the morning of my wedding. Sharon first did my make up for a wedding I was attending, I was just after having a baby and as you can imagine I was exhausted with black circles down to my chin. I not only received many compliments on the day (no touch ups needed), but in the photos people have commented on young I look in them, all I can say is Sharon worked her magic. I have used and recommended Sharon on many occasions since this, for special nights out, and as part of a bridal party. Sharon is highly professional with a bright and bubbly personality and a great sense of humour, that will put any bridal party at ease. Her attention to detail and the personal taste of each person is never compromised. I’ve been raving about her to my friends so much that I have contacted her recently to do a girls night in for a group of us and I am thoroughly looking forward to it. I have had my make up done on many occasions for different events, but Sharon takes it to another level… with her box of tricks she is a make-up magician. Sharon has done my make up for me on many times for different occasions. I find her just brilliant. She is extremely professional and my makeup always turns out amazing. Sharon has a range of makeup to choose from and knows exactly what will suit your face, colouring and your outfit. She is excellent on creating the key look you want whether it is for a night on the town, a wedding or for something more relaxed. Sharon recently did my make up as part of a bridal party. Everyone of the bridesmaids and bride were more than delighted with the results. The makeup lasted the whole day, and looked so natural. Sharon managed to calm our nerves by chatting away to us all and stayed with us until we were ready to run off to the church in case of any last minute top ups! I would highly recommend Sharon as a Top Makeup artist to everyone. Sharon gave me a special look for my birthday party. I was delighted with the outcome especially my eyes. They looked amazing and I received many compliments. Sharon is a very professional make up artist. She came up with several different ideas and was able to explain them to me very clearly. I was spoilt for choice!!! I would definately use Sharon again for any occassion where I want to look my best. 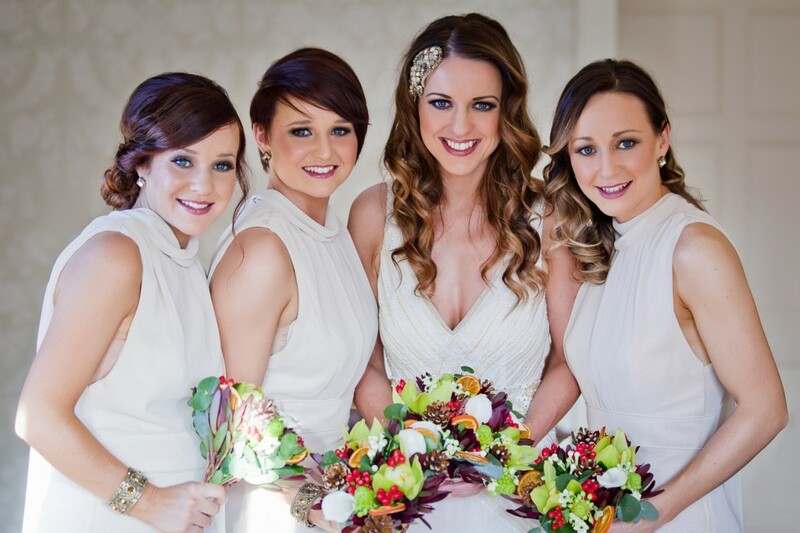 I was completely impressed by the professional service provided by Sharon McCormack Make-up. Sharon was efficient in having my make-up prefect, yet done in a timely manner acording to my taste. She provided excellent artistic advice in make- up application and was competively priced. I received numerous positive compliments on my make-up which lasted throughout the wedding day without a single touch up. I would recommend Sharon to anyone who expects high standards in make-up application.